Mold and mildew are nasty. They are best friends and often show up at times and places you least want them. The pair is usually invited to your home by moisture. The problem is that regardless of the condition of your home moisture is present. Your bathroom and kitchen are the usual places mold and mildew will move in but they also like attics, basements and any other cold, damp location. Once they move in, it can take some work to get rid of them. A professional service that handles mold clean up could easily take care of this job so you don’t have to. As if you haven’t heard enough about the evils of smoking, driving under the influence or running with scissors, mold is another one of those things that are bad for your health. Here’s the inside scoop on why: mold spores can be microscopic in size which means when you take a deep breath many of them can get a free ride deep into your lungs. Mold contributes to nasal and sinus congestion, irritations of the eyes and skin as well as a menu of respiratory complications. Yuck! Sure, it’s easy these days to fake a lot of things but mold removal is not one of them. A professional Mold cleaning expert (there is such a thing) has specialized training. Call it Mold Clean Up 101 if you must, but they have the skills to tackle the issue quickly and efficiently. In other words, they have certifications that took hours of classroom time and practical hands-on training. If you think you can crawl into a damp basement with a handkerchief wrapped over your nose and mouth for protection, you’d be wrong. Taking an extra dose of Vitamin C may hold off the sniffles for a little while but mold and mildew require removal and you can’t do it effectively in a t-shirt and shorts. Did we mention the skin and eye irritation factor that comes with mold? 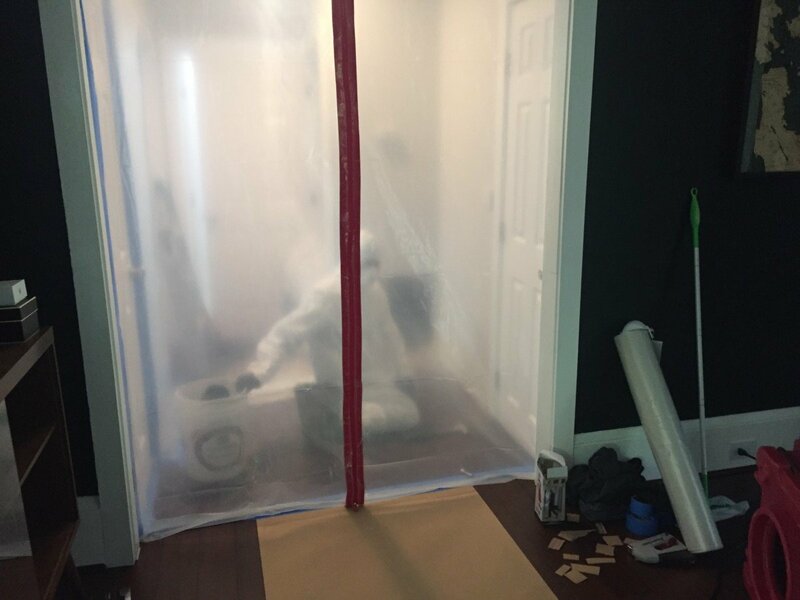 Well, that’s why a professional mold removal expert will show up on site wearing gloves, jackets, overalls and gas masks to avoid direct contact with the mold. A piece of paper towel and a blow dryer is not going to help you much if there is mold growing on the wall of your kitchen. Sure, you can bleach it, scrub it and give it a serious going over but all you’d be doing is tickling the mold. A professional mold removal expert will have industrial grade vacuums, pressure washers, suction tools. They also have other great gadgets to not only collect all the mold and mildew currently not paying rent in your home, they will eliminate the conditions that invited the nasty buggers there in the first place. There is a really nifty way to kick out those freeloading mold and mildew spores from your home. It has a lot to do with seeking the source of the moisture that opened the door in the first place. A professional mold removal expert can examine the surrounding area where the mold was living and determine where it came from. There may be a hidden leak or some other entry point that you may not even be aware exists. Don’t mess around with mold. Get someone who knows what they are doing on the problem so it gets fixed right – the first time!